That lovely man (and once fabulous footballer) Cliff Jones � 83 years young � led the applause for Harry Kane�s latest brace of goals, and was gracious enough to say on line that he looks forward to him overtaking his club haul of 159 goals. �One-season-wonder� Kane has in the blinking of an eye already gone past Jermaine Defoe�s impressive collection, as our guru Paul H. Smith reports HERE. It launched a perfect weekend for Our Harry, a golf fanatic who yesterday cheered on that magnificent Ryder Cup victory by the European team. On the football field, he is no longer below par. Welcome back, Aitch. Incidentally, if you like golf too, check out these US Masters betting offers for some great information. 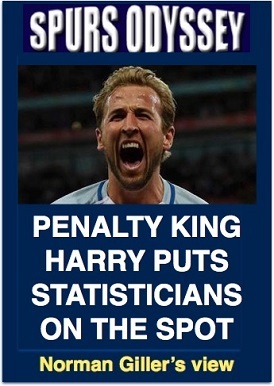 When Kane powered in his spot-kick against Huddersfield, I was asked who I consider the best Tottenham penalty taker I have seen. I conjured up a parade of "12-yard" specialists on my memory screen, and for facts to go with my feelings I turned to my Spurs records inherited from the late master statistician, Leslie Yates. Tottenham facts and figures men have to bow the knee to Leslie as the father of Spurs statisticians, with the much-mourned Andy Porter taking over the baton and, figuratively speaking, giving shape and meaning to the club�s history. (Note to older supporters: All those threepenny pocket-size Tottenham programmes you used to read avidly were written by Edmonton-born Leslie, who was a Spurs fan from the early 1920s before becoming an outstanding journalist and eventually programme editor). For the modern records, I always turn first to the information-jammed www.myfootballfacts.com website, that is diligently kept up to date by the omniscient, Israel-based Paul Yarden. Took most of the penalties for the Push and Run Spurs. Alf was a poker-faced perfectionist who liked to side-foot rather than power the ball past the goalkeeper. He was also a deadeye from the spot for England, scoring three times in his 32 appearances. Total penalties scored for Spurs: 20. Tottenham�s �Tom Thumb� of a midfield maestro was an artist from the penalty spot. Converting 23 spot-kicks for Spurs during his ten years at White Hart Lane, he was all subtlety from the spot. He used to win mind games against goalkeepers and then celebrate with a wave in the air like a magician finishing his trick with a flourish. Arguably the greatest British goalscorer in history, Jimmy did not enjoy taking penalties and reluctantly inherited the responsibility from his skipper Blanchflower. He could take penalties with either foot, but most times favoured the left. One of the 28 he scored for Spurs brought the great Gordon Banks to boiling point. Gordon was in the back of the Leicester net rubbing his gloves on dry grass when Jimmy jokingly rolled the ball into the opposite corner. To the amazement and amusement of Greavsie � and the anger of Banks � the referee awarded a goal. Gordon got booked because of the understandable force of his protests. A funny old game. As with everything he did on the football field, Glenn was a total perfectionist who spent hours in training practising his penalties. He found the net with 29 of his spot-kicks, sometimes with audacious chip shots and always with careful consideration and preparation. Glenn played mind games with the goalkeepers and concentrated on placement in preference to power. One of the most skilful players of his generation, Teddy was a master of all the footballing arts and he was deadly accurate from the spot. He netted 20 penalties for Tottenham and always put them away with aplomb. The irony was not lost on Spurs supporters when � in his debut for Manchester United � penalty king Sheringham missed from the spot against � Tottenham. A cruel old game. A prolific goal scorer throughout his career, Robbie never shirked the responsibility of taking penalties and was bang on target 19 times for Spurs. He used to mix net-busters with cleverly placed shots, and usually seemed a thought ahead of goalkeepers. During his goal-gorged, have-boots-will-travel adventure, he has notched more than 50 goals from the penalty spot. If you put me on the spot and ask me to choose just one of these magnificent players to take a penalty to save my life I think I would give the job to Glenn �Hod the God� Hoddle. He mixed power, skill and confidence into a winning cocktail. But all the penalty takers named here have to bow the knee to powerful full-back Tommy Clay, who either side of the First World War scored no fewer than 37 goals for Spurs from the spot. Yes, Clay was The Greatest! If Tottenham have a penalty against Barcelona at Wembley on Wednesday, I know who my money will be on to find the net. But I won�t name him here for fear of jinxing him. I think you can guess who I mean. Think I�ve come out in spots. Who followed David Pleat to White Hart Lane from his home town club of Luton, and what number Spurs shirt did he wear in an FA Cup final at Wembley? Please email your answer to me at SOQL7@normangillerbooks.com. Deadline: midnight this Friday. I will respond to all who take part. This year�s prizes for the champion: two books from my Spurs collection with autographs from Jimmy Greaves, Steve Perryman and Dave Mackay, and a framed certificate announcing the winner as SOQL champion. Last week I asked: Who won 24 England caps, and against which team did he score in a Boxing Day debut for Tottenham after joining from Aston Villa? Please keep a check on your scores, because several of your emails went missing last week. I will be trusting you to count your points. I have as much faith in my email server as I do in a Senate committee.